... and to Dan Fennell for his 50th! The february points have been addd in the file. Still the same two leaders, well done Barbara and Morten. I don't think haaico is following this thread, but last month he reached the milestone of a half century of CTCs for us. Since the new month has started I have updated the table. The FS1 reached the highest score up to now this year, congratulations. The top 6 remains the same. - Both Michelle Houghton and Roger Burrell now have a full century of CTCs! They are the 9th and 10th Free Spirit to reach this milestone. - Sheena Haveman rowed her 25th! - Colin Kelly is a new name on our CTC roster. Welcome! - I'm assuming that March's K Reardon is the same person as January's and February's Kenneth Reardon, who in turn is the Ken Reardon that rowed 14 CTCs for us between 2006-2012. The table has been adjusted. The lowest number of participants this month but at least everybody has found a boat. Barbara and Morten still going strong together. 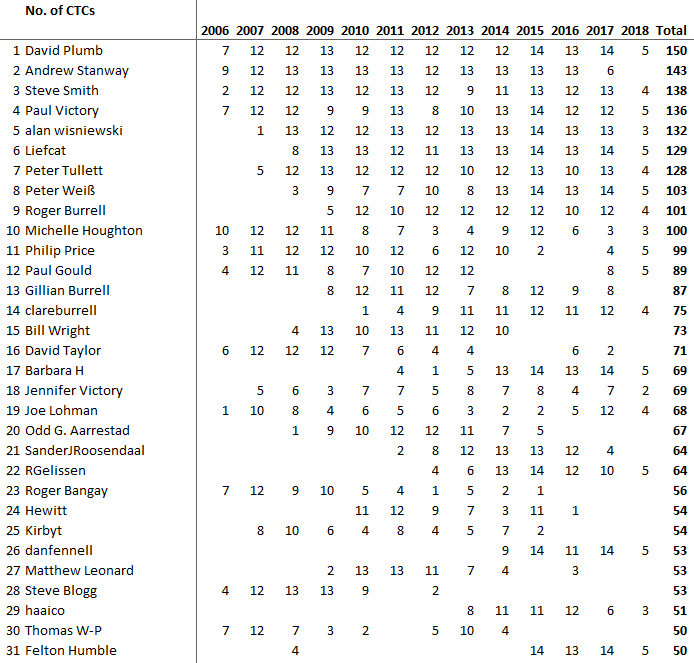 It's been a while since I posted one of these, the list of Free Spirits with 50 or more CTCs. Special attention and congratulations to Plummy who has now rowed 150 of these. Also to Clare for her 75th and Felton for his 50th! Congratulations Felton, joining the 50 plus club is a great achievement . I hope to join you in about 4 years! Congratulations to Mr Plumb, amazing dedication. Also to Michelle for great perseverance through many injuries. Huge congratulations to Philip Price (Pepe) who rowed his 100th CTC for Free Spirits in May! Whahey! I believe we need to welcome one new convert to the CTC: Atle Behzadi Ravndal! - WiganLad (a.k.a. hewitt, 2016). Last edited by Rodger on Fri Jun 01, 2018 11:15 pm, edited 1 time in total. As for this year's scores we have 7 new entries this month. And the most participants so far. Let's see what tis month brings with so far already 7 entries on the first day. The top 4 is still the same, Morten and Barbara unseperable together number one. Dan is a strong climber in the top 10, from 7 to 5. Personally I cherish my top 10 position for this month. No doubt Max and (if not this month then next month) Clare will overtake me. Both missing Valentine's day but catching up rapidly. And Guy offcourse, still a bit more behind but not for long I think. Question: Can you see the May-results in the sheet from which I've put the link in the messages above. Max can't, I can, I wonder what others see. fkoene wrote: Question: Can you see the May-results in the sheet from which I've put the link in the messages above. Max can't, I can, I wonder what others see. I can, but if anyone else can't it might be an access issue. Ok, Ian has extended rights but Tako doesn't (nothing personal ), so I think the problem is with Max. Thanks for checking. Thanks all for your help. I accessed using a different device which worked. Then went back to my normal one which worked as well.